Deeply cool, though, is the Network option below Console. This reveals a timeline that shows you how long each part of the current Web page took to load over the network. The bars are colour-coded by media type: green for style sheets, purple for images, and so on. This is a really great way to see how long your site is taking to load, and what the bottlenecks are. I’ve used a few such network profiling tools in the past, but none are as readily accessible (and as pretty) as this one. Moving further down the Develop menu, we have the Snippet Editor. Enter HTML and CSS directly into the top pane of the Snippet Editor window, and the rendered results appear in the bottom pane. This can be useful for testing small snippets of markup without having to edit a Web page, but in practice I find it’s more useful to just go ahead and test within the page proper. 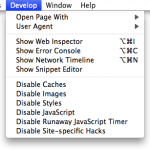 Disable Caches: Temporarily turns off caching, forcing Safari to fetch Web pages, images and other resources from the net each time they’re needed. Great for making sure you’re looking at the most recent version on your server. 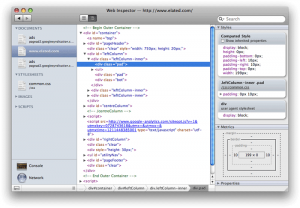 Disable Images: Replaces all images in the page with the contents of their ‘alt’ attributes. Good for checking you’ve included ‘alt’ attributes for all your images (as every Web developer should!). Disable Styles: Turns off all CSS styles, displaying the markup without any CSS applied. Useful for making sure your page makes sense to non-CSS user agents, such as text browsers, screen readers and, perhaps most importantly, search engines. 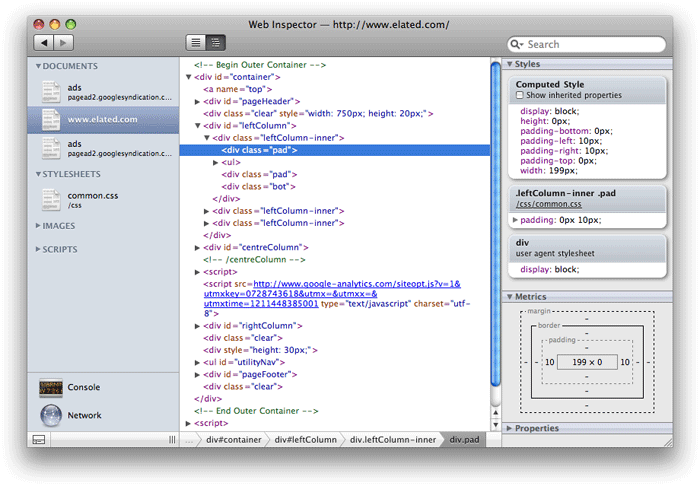 The Develop menu in Safari 3 is a powerful beast, and it’s a great way to debug Web pages. I find myself using it quite a bit these days (as well as Firebug in Firefox). By the way, if you’re after more general info on developing Web pages with Safari, the Apple developer site has a decent Safari Developer FAQ. This entry was posted on Thursday, May 22nd, 2008 at 8:20 pm	and is filed under Mac tips & tricks, Software, Uncategorized. You can follow any responses to this entry through the RSS 2.0 feed. Both comments and pings are currently closed. Very cool. I’d never even noticed this before! It’s great isn’t it. 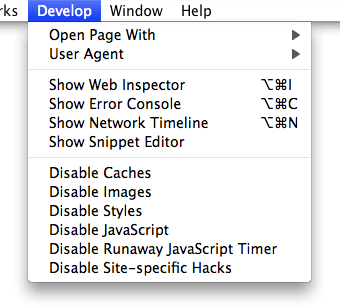 Safari 2.x had the Debug menu which was pretty good, but this is better! 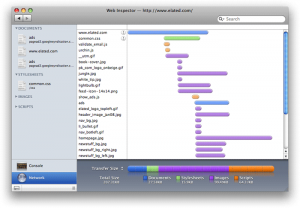 Nice overview of the new Safari 3 features. 1) Insist on keeping the standards (not a bad idea), but make some popular (albeit poorly designed/tested sites) look bad. 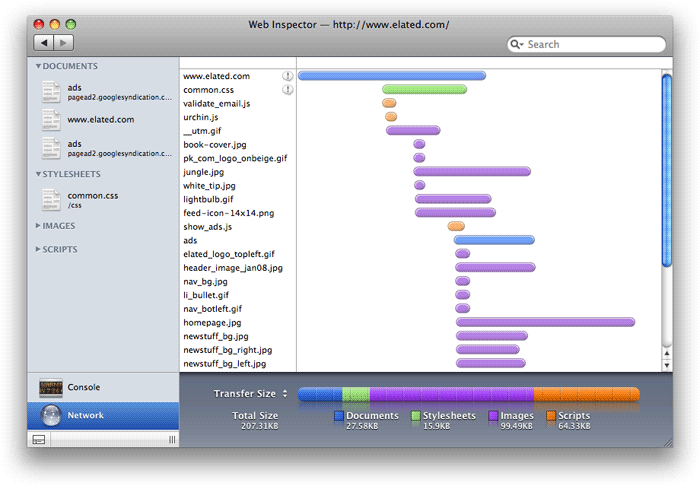 2) Compromise by breaking Safari’s excellent standards compliance and make it render things in a non-compliance method. 2) Create site specific CSS hacks to get the best of both worlds. Transparently change the CSS (the real source of the problem) to make things look as people would expect, and do not compromise the excellence of your rendering engine. That is not to say there aren’t some down sides to Option #3, but I would think they are of less concern than #1 and #2. @Percy: Yes that’s my guess too. It’s the lesser of 3 evils as you say!